Lucknow Army Recruitment Rally Online Registration 2018 : Lucknow Army Rally Bharti 2018 Age, PFT, Height, Chest, Weight, Medical, Written Lucknow Army Recruitment Rally Bharti at Kanpur. Indian Kanpur Army Bharti last Date 2018 Army Rally Bharti Kanpur Schedule 2018 Kanpur Army Bharti Mela Army Bharti Lucknow ZRO Lucknow Army Relation Bharti Indian Army Rally Bharti Lucknow Army Rally Bharti Lucknow 2018 Army Rally Bharti Lucknow Zone 2018. Lucknow Army Rally Bharti 2018 Age, PFT, Height, Chest, Weight, Medical, Written Lucknow Army Recruitment Rally Bharti at Kanpur. The Indian Army has published the Lucknow Army Recruitment Rally Bharti 2018 process is going be held from 26 September to 14 October 2018 at Kanpur Cantt Lucknow by Recruiting Zone Head Quarter Lucknow. All the candidates from Banda, Hamirpur, Fatehpur, Kanpur Nagar, Lucknow, Auraiya, Barabanki, Kannauj, Gonda, Unnao, Kanpur Dehat, Mahoba, and Chitrakoot can participate in Army Rally in Lucknow September 2018 for the post of SGD, STT, CLK, SNA, STD, STA, TDN before the last date of application. Army recruitment Rally will be held for eligible candidates of districts Auraiya, Banda, Barabanki, Chitrakoot, Fatehpur, Gonda, Hamirpur, Kannauj, Kanpur Dehat, Kanpur Nagar, Lucknow, Mahoba and Unnao from 26 Sep 2018 to 14 Oct 2018 at Kanpur Cantt. Gates will be open at 0030hrs and will be closed by 0600hrs on each day. Candidates who are going to apply for Lucknow Army Bharti 2018 should have the required age which is decided by the Indian army board. The age limit criteria may vary from post to post. GD: Candidate should not less than 17 ½ years and not more than 21 Years. For all other posts like Clerk, SKT, Tradesman, Technical, and NA: 17 ½ to 23 Years. Soldier GD: (a) Candidate should have passed 10th Class with minimum 33% marks in each subject and 45% aggregate Marks. OR 12th class simple passes. Soldier Tradesman: 8th Pass or 10th pass according to trades. Clerk/SKT: 12th pass from any stream with 60% aggregate. Sol NA: 12th pass with PCB. also, have 50% aggregate marks and 40% marks in each subject. Sol Technical: 12th pass with Physics, Chemistry, Maths, and English. also, have 50 % aggregate and 40% marks in each subject. Selection Process of Kanpur Army Rally Bharti will be majorly conducted In 4 stages i.e. Physical fitness test, Physical Measurement Test, medical test and written test. For Soldier Tradesman, there will be one additional stage i.e. Aptitude test, In this test, you have to perform a particular task according to your trade skills. You have to reach Kanpur Cantt, Kanpur, Uttar Pradesh on 26 Sep 2018, exact date and time will be mentioned on your Admit Card. Screening of documents, physical fitness test, physical measurement test etc will be done as per ARO Lucknow. Group-I. Up to 05mins 30 sec – 60 Marks. Group-II. From 05 mins 31 sec to 05mins 45 sec – 48 Marks. Try to come in the group-I so that you will get extra bonus marks which will help on your final merit list, If not don’t miss group-II otherwise you may get failed in this stage only. 6 Pull Ups – 16 Marks. 7 Pull Ups – 21 Marks. 8 Pull Ups – 27 Marks. 9 Pull Ups – 33 Marks. 10 Pull Ups – 40 Marks. Zig-Zag Balance / Balancing Beam – Need to Qualify. 9 Feet Ditch jump – Need to Qualify. In this test, the team of ARO Lucknow will measure your height, weight & chest. 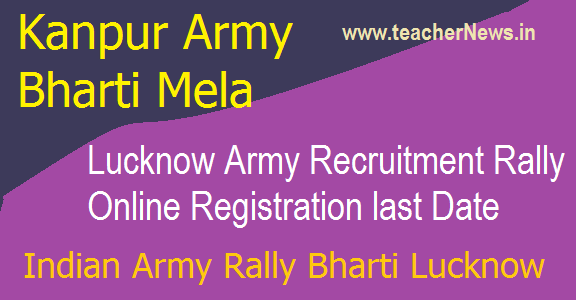 Kanpur Army Recruitment Rally Bharti Lucknow Online Registration last date, ARO Lucknow Army Rally Bharti Lucknow, Army Lucknow Zone Open Bharti Rally UP UK Recruitment 2018-2019.